The sequence is conserved in mouse and rat. Positive control: Human epidermoid carcinoma (A431) cells; 3T3-L1 adipocytes. Janus Activating Kinase 2 (JAK2) is a 130 kDa tyrosine kinase involved in cytoplasmic signal transduction. Ligand binding to a variety of cell surface receptors (e.g., cytokine, growth factor, GPCRs) leads to an association of those receptors with JAK proteins, which are then activated via phosphorylation on tyrosines 1007 and 1008 in the kinase activation loop. Activated JAK proteins phosphorylate and activate STAT (signal transducers and activators of transcription) proteins, which then dimerize and translocate to the nucleus. Once in the nucleus, STAT proteins bind to DNA and modify the transcription of various genes, which can lead to various responses such as cell proliferation, cell survival and differentiation. The JAK2 antibody is useful as a positive control and for measuring total JAK2 protein levels to compare signals obtained with the JAK2 PSSA. Frank, G.D., et al. (2003) Distinct mechanisms of receptor and nonreceptor tyrosine kinase activation by reactive oxygen species in vascular smooth muscle cells: role of metalloprotease and protein kinase C-delta. Mol. Cell. Biol. 23(5):1581-1589. Kaszubska, W., et al. (2002) Protein tyrosine phosphatase 1B negatively regulates leptin signaling in a hypothalamic cell line. Mol. Cell. Endocrinol. 195(1-2):109-118. Kirito, K., et al. (2002) Thrombopoietin regulates Bcl-xL gene expression through Stat5 and phosphatidylinositol 3-kinase activation pathways. J. Biol. Chem. 277(10):8329-8337. Shaw, S., et al. (2002) Janus kinase 2, an early target of alpha 7 nicotinic acetylcholine receptor-mediated neuroprotection against Abeta-(1-42) amyloid. J. Biol. Chem. 277(47):44920-44924. Sutherland, C.L., et al. (2002) UL16-binding proteins, novel MHC class I-related proteins, bind to NKG2D and activate multiple signaling pathways in primary NK cells. J. Immunol. 168(2):671-679. Zeng, Z.Z., et al. (2002) 5(S)-hydroxyeicosatetraenoic acid stimulates DNA synthesis in human microvascular endothelial cells via activation of Jak/STAT and phosphatidylinositol 3-kinase/Akt signaling, leading to induction of expression of basic fibroblast growth factor 2. J. Biol. Chem. 277(43):41213-41219. Eguchi, S., et al. (2001) Activation of MAPKs by angiotensin II in vascular smooth muscle cells. Metalloprotease-dependent EGF receptor activation is required for activation of ERK and p38 MAPK but not for JNK. J. Biol. Chem. 276(11):7957-7962. Madamanchi, N.R., et al. (2001) Thrombin regulates vascular smooth muscle cell growth and heat shock proteins via the JAK-STAT pathway. J. Biol. Chem. 276(22):18915-18924. Myers, M.P., et al. 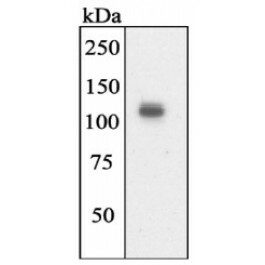 (2001) TYK2 and JAK2 are substrates of protein-tyrosine phosphatase 1B. J. Biol. Chem. 276(51):47771-47774. Madamanchi, N.R., et al. (2000) Reactive oxygen species regulate heat shock protein 70 via the JAK/STAT Pathway. Arteriocher. Thromb. Vasc. Biol. 21(3):321-326. Amiri, F., et al. (1999) Hyperglycemia enhances angiotensin II-induced janus-activated kinase/STAT signaling in vascular smooth muscle cells. J. Biol. Chem. 274(45):32382-32386. Ihle, J.N. (1996) STATs: signal transducers and activators of transcription. Cell 84(3):331-334. Store the product (in aliquots) at -20 °C. Can be shipped at 2 - 8 °C. This antibody detects JAK2. Jak2 is expressed in blood, bone marrow and lymph node.